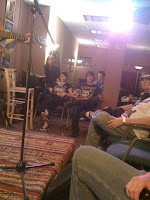 Here are some pics from the show I did with Lenny Lashley last Saturday. Photos from Matt V and Lauramom. Me and Ken casey from the Dropkick Murphys. I'm representing The New Jersey Turnpike in my T-shirt. My mom behind a guy picking his nose.